future trends in cleaning and decontamination, for example the idea of changing surfaces, to hinder the absorbance of dirt and thus make cleaning easier. A brief introduction is given to the legal demands concerning the environment and a historical background, in terms of development of detergents, from soaps to the modern sophisticated formulations. Bactericides, their use and the environmental demands on them are covered. 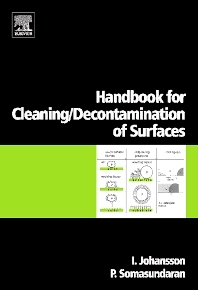 Thorough discussions of mechanisms for cleaning are given in several chapters, both general basic concepts and special cases like particle cleaning and cleaning using microemulsion concepts. For physical chemists, surface chemists, biochemists, materials scientists, environmental scientists, analytical chemists. Volume 1 Physical Aspects of Cleaning Processes (W. von Rybinski). Laundry cleaning of textiles (J. Burckett St. Laurent et al.). Formulation of Carpet Cleaners (J. Williams). Dish and Household Cleaning (G. Szewczyk). A review of key ingredients used in Auto-dishwashing formulations past and present and the physico-chemical processes they facilitate. (A. Tomlinson, J. Carnali). Personal Cleansing (Kumar Subramanyan, K.P. Ananthapadmanabhan). Shampoo Formulation (K. Klein, I. Palefsky). Surfactant Action on Skin and Hair: Cleansing and Skin Reactivity Mechanisms (L. Rhein/Sheads). The Cleaning of Teeth (A. Joiner). Dry Cleaning of Textiles (K.D. Hasenclever). Wet Cleaning of Textiles (K.D. Hasenclever). Vehicle Cleaning (Mahnaz Company, D.R Karsa). Back End of Lines (BEOL) cleaning (S. Raghavan et al.). Cleaning of Trace Metallic Impurities From Solid Substrates Using Liquid Media (Dr. S. Verhaverbeke). Elevated Pressure CO2-based Fluids Containing Polar Co-solvents for Cleaning in Microelectronic Device Fabrication (G. Levitin, D.W. Hess). Chemical Disinfection of Hard Surfaces – Household, Industrial and Institutional Settings. Chemical Disinfection of Hard Surfaces – Household, Industrial and Institutional Settings (E. Fu et al.). Volume 2 Understanding the Environmental Safety of Surfactants: A Historic Perspective (M. Stalmans et al.). Ultimate Biodegradation of Ingredients Used in Cleaning Agents (C.G. van Ginkel). Life Cycle Assessment (J. Widheden, E. Ringström). The ecotoxicity of cleaning product ingredients (J. Steber). Surface analytical techniques applied to cleaning processes (M. Ernstsson, Torbjörn Wärnheim). Self-Cleaning Surfaces Using the Lotus Effect (F. Müller et al.). Anti-bacteriological effect of nanoscaled inorganic particles in coating matrices (C. Göbbert). Application of Microemulsions in Cleaning Technologies and Environmental Remediation (E.J. Acosta et al.). New techniques for optimization of particulate cleaning (P.M. Claesson et al. ).